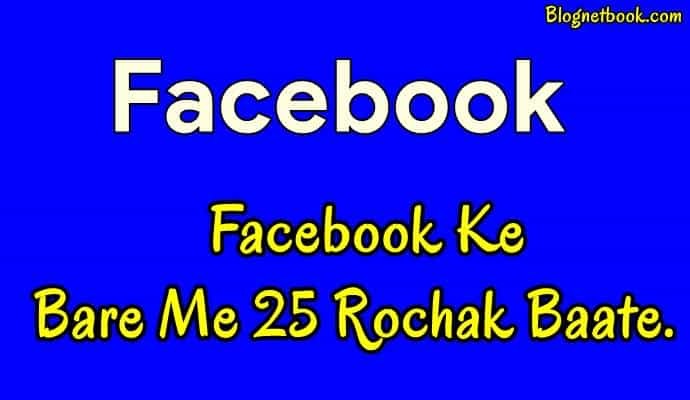 Top 25 interesting facts about facebook in hindi ( Jo apko pta nhi honge) Blog Net Book: Top 25 interesting facts about facebook in hindi ( Jo apko pta nhi honge) | Blogging Internet Ki Puri Jankari Hindi Me! Ek Univercity ke student ke dwara start ho kar Aj Facebook duniya ke No 1 social media site bona hai fb starting me sirf Univercity ke student ke bich me hi simit tha par baad me ye Vishal roop dharan kya hai aj duniya ke No 1 social site bon gaya hai eshe vi bahut se facts about facebook ke bare me batate hai. fb ke bare me jo me aj ap logo ko botane ja ra hu. facebook ab her person ke best hai. hor ek internet user apne friend or relative se jude rehene ke liye fb par time spend karte hai. kuch log fb ko sirf timepass kelie use karte hai or kuch log ache paisa vi earning kar rahhai ese vi bahut log hai jo ap ne companies,business,website ya blog ko facebook ke duwara promote karne ke liye vi fb use karte hai. To chaliye jante face intersting facts about facebook in hindi. Facebook world ki second website hai jo sabse popular hai, 1 number google ka aata hai, according to Alexa rank . essia me sabse Jayda facebook use karane wale log hai jo 450 Million ke kariab . is smye 79% log facebok ka use mobile me karate hai. Facebook ka pahale name The Facebook tha jo ki Haward university ke student tak hi simit tha. Agar facebook ek country hota to ye world me ka 5th number ka desh hota. Florida desh ke kanun ke anusar ek Jaj aur Wakil facebook friend nahi ho sakate hai. Facebook par 300 PetaBytes 300000000 GB ka data jaise images, videos, save hai. Har ek minute ko karib 293000 status facebook per updates kiye jata hai, are sath me 136000 photo update hote hai. Facebook ki main income ka source mobile advertisement hai. Facebook mobile advertisement se karib $1.4 million revenue earn karta hai. 1 millions se bhi upar apps ki links facebook se judi hui hai. Kariban her ek user 55 minutes facebook par bitata hai. Agar aap facebook ki koi galati nikalate ho, aur wo sahi hai to facebook aapko uske badale me inaam deta hai. Agar facebook ka server 1 minutes ke liye bhi down ho jaye to facebook ka million ka nukasan ho jata hai. Facebook ka use karana kayi desho (Seriya, Iran) me ban hai. Facebook par 80 million fake profiles hai. Canada ye ek yesi country hai jiske sabse Jayda user facebook par active hote hai. Facebook ke CEO Mark zukurberg hai, inki salary kebl $1 hai Lekin apki jankar hairani hogi ki ye world ke 4 richest person me se ek hai. Facebook ka first pageAI Pacino ka hai. Apko jankar hairani hogi ki Facebook ne kebal china ke 95 lakh se jyada logo ko block kar rakha hai. Facebook par daly 61000 se adhik account hack hote hai. Facebook par abtak 100 lakh se jyada video dekhe ja chuke hai ye Facebook ke kamai ka one fourth source hai. Facebook offical page per 1 minute me karib 500000 likes kiye jate hai.